Home Local News BREAKING: 468Million US$ worth of AFP fighter jets, gone under Noynoy admin! BREAKING: 468Million US$ worth of AFP fighter jets, gone under Noynoy admin! 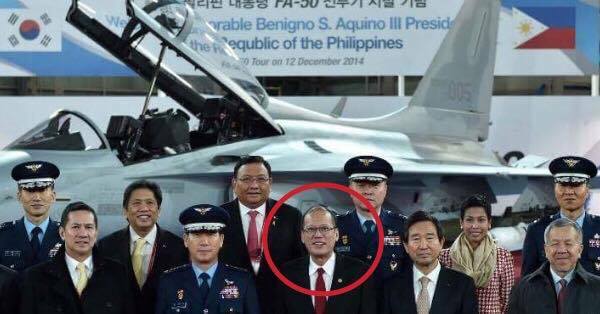 The Benigno C. Aquino III administration as recommended by then Defense Secretary Voltaire Gazmin and approved by Executive Secretary Paquito Ochoa acquired 12 units of Korean Aerospace Industries ( KAI ) FA-50 jet aircrafts costing US$ 468-Million as among the major acquisitions of the P 170-Billion AFP Modernization Program. Many millions more were spent for munitions including missiles and bombs to hit air and land targets. The overpriced, unproven and limited production jet aircrafts were advertised as Multirole Fighters ( MRF ) for air defense, ground attack and reconnaissance using air-to-air, air-to-ground missiles and precision guided bombs among other advance munitions. The KAI FA-50 multirole fighter aircraft was advertised as capable of attacking ground targets with Maverick air-to-ground missiles and precision bombs, guided by advance Israeli-made Elta radar and fire control system. The features, performance envelope and combat capabilities were cited to justify the high price tag of US$ 38.8-Million per unit contracted by the Department of National Defense for the Philippine Air Force. Advertisement However, my research indicate an overprice of US$ 8.8-Million per unit, when compared to the acquisition price of the same KAI FA-50 model acquired by the Republic of South Korea Air Force at US$ 30-Million per unit, while Indonesian Air Force acquired the KAI TA-50 model optimized for attack role at US$ 25-Million per unit with provision for technology transfer. After PRRD criticized the Korean-made aircrafts as useless and good only for fly-bys, sources from the PAF leaked serious technical issues of incompatibility between the radar-fire control system with the U.S. Sidewinder air-to-air missiles and perhaps with the ground attack missiles and precision guided bombs it was suppose to carry for the required combat missions. After 10 days of intense fighting in Marawi, the PAF could have deployed these MRFs for precision ground attack role. So far we have witnessed only helicopters and propeller-driven SF260 light attack aircrafts doing ground attack, using unguided 70mm air-to-ground rockets and machine gun fire for strafing and conventionally dropped 250 kg. bombs. No precision TV or radar guided AGMs or JDAMs! Perhaps this is the reason why DND Sec. Delfin Lorenzana went public to reveal the shortcomings faced by our soldiers fighting on the ground and pilots providing air support. Sponsor A pro KAI FA-50 lobby group will surely crank up into action to defend / rationalize the flawed acquisition of these overpriced, unproven limited production jet trainers passed off as high performance multirole fighters. The past DND-AFP-PAF leadership binded the national government in a lopsided contract costing the Filipino taxpayers US$ 468-Million for under rated combat aircrafts. Worst, these past officials compromised the national security of the Republic of the Philippines and the Filipino people. They are endangering the lives of our soldiers and airmen, but more so the safety of the citizenry they are duty bound to defend. The amount involved makes the pork barrel fund anomalies look like petty cash. Is a public inquiry necessary in this regard?